A man from Llandysul in Ceredigion, Wales, says he is planning to carry a huge wooden cross from St Davids in Pembrokeshire to the top of Mount Snowdon after being set the gruelling challenge by God. 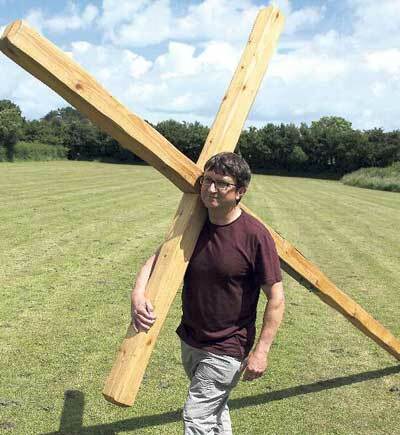 Standing 12ft tall, measuring 6ft wide and made from 4x4 cedar timber, the cross weighs 25kg, meaning that Emyr Mathias’ month-long hike from 13 September will not be an easy walk of faith. Emyr, 48, a Christian for the past 31 years, says he is taking on this physical and emotional challenge in response to a calling he received from God. “I had a vision that the Lord wanted me to carry a St Davids flag from St Davids to Snowdon,” he said. “I thought that was ridiculous at first, but then the Lord said about the cross.” Despite rating his fitness as “average”, Emyr has now embarked on a rigorous fitness regime in preparation for the march. “I walked 15 miles with the cross the other day and felt good afterwards,” he said. “I started at 8am and finished at around 3pm."